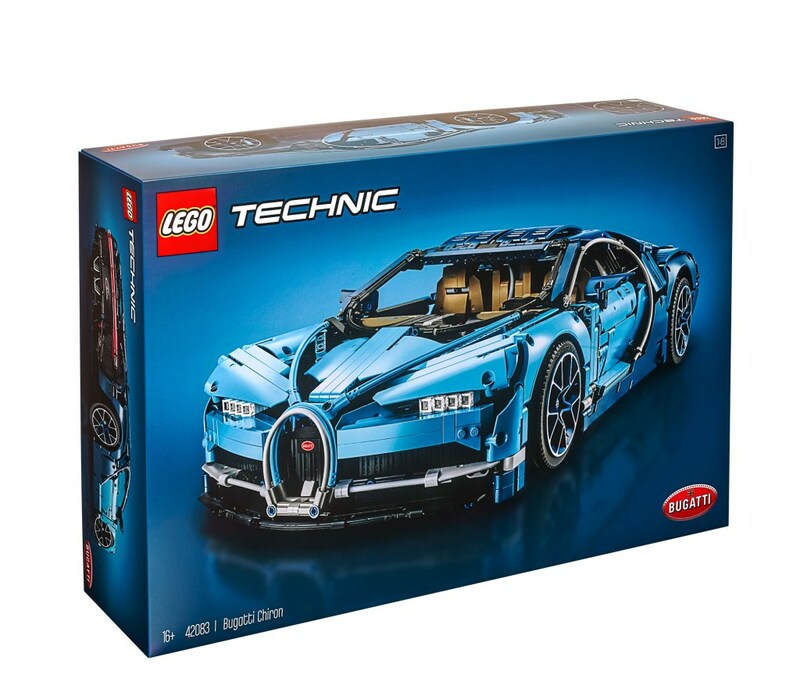 LEGO’s new 42083 Technic Bugatti Chiron is finally here! Teased here earlier in the year, and joining the previously revealed Technic sets in the 2018 H2 line-up, LEGO’s officially licensed 3,599 piece 1:8 scale recreation of the world’s fastest production car will go on sale worldwide on August 1st priced at $350, and it looks incredible. 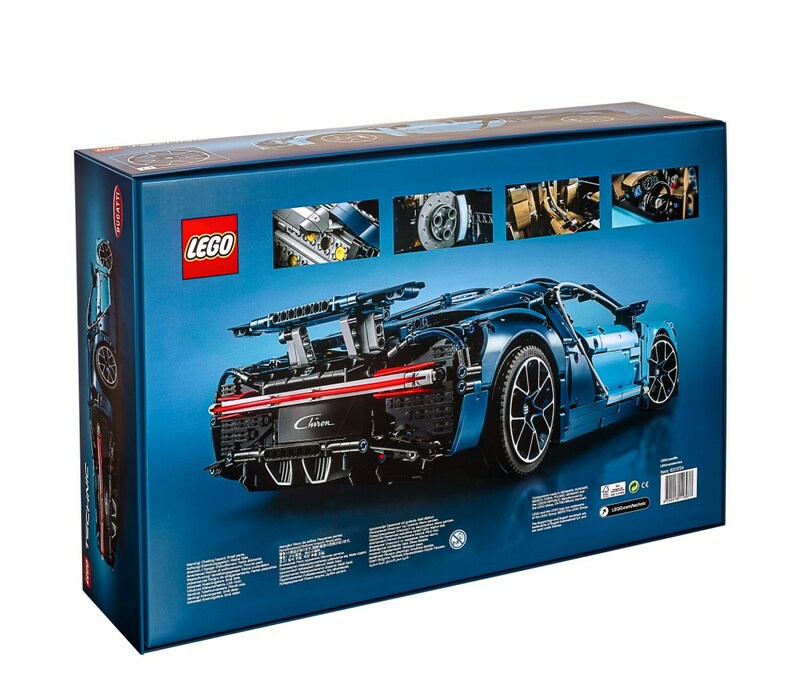 Following the 2016 42056 Technic Porsche GT3 RS set, LEGO’s new Bugatti flagship becomes the biggest, the most detailed and the most technically advanced supercar set to date. Underneath the beautifully replicated bodywork in Bugatti’s signature blue sits a working W16 piston engine, the largest ever fitted to a Technic model and true to the real car’s quad-turbo 8.0 litre W16. Double wishbone suspension, working steering and an eight-speed paddle shift-operated gearbox all feature alongside it and, like the Porsche GT3 RS set, the build process mirrors the Chiron’s actual factory production process of marrying these components together once each is completed. 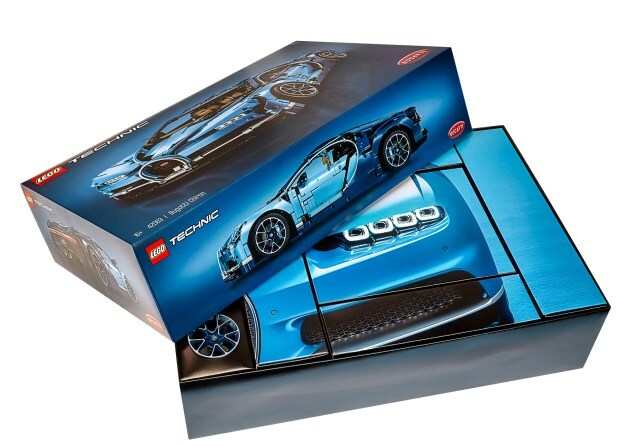 LEGO’s 42038 Technic Bugatti Chiron set also includes a brick-built ‘top speed’ key, which the real Bugatti Chiron features to enable the car to hit its electronically limited top speed of 261mph. The 42083 set uses this to adjust the Bugatti’s rear air-brake/spoiler between its three settings, including a locked position for high speed runs across the kitchen floor. New wheels – authentically replicating those found on the real Bugatti Chiron, tyres, bespoke Bugatti decals, and a limited-edition numbered brick are all included in the set, plus 42083 features a beautifully designed box (pictured above) and a coffee-table style presentation book – as first debuted on the 42056 Porsche 911 GT3 RS set in 2016. 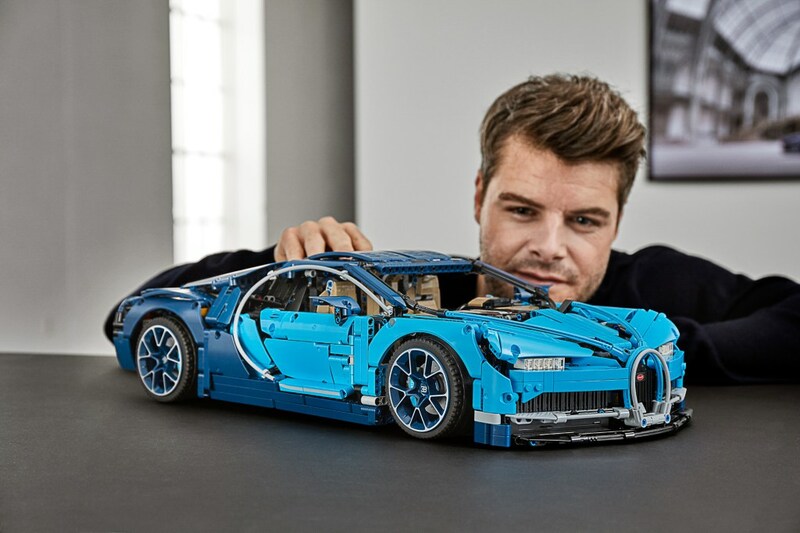 LEGO’s 42083 is available to buy today from LEGO.com (click here to visit the official 42083 Bugatti Chiron webpage) and will reach stores worldwide from August 1st. Start saving! Billund, 1st of June 2018. 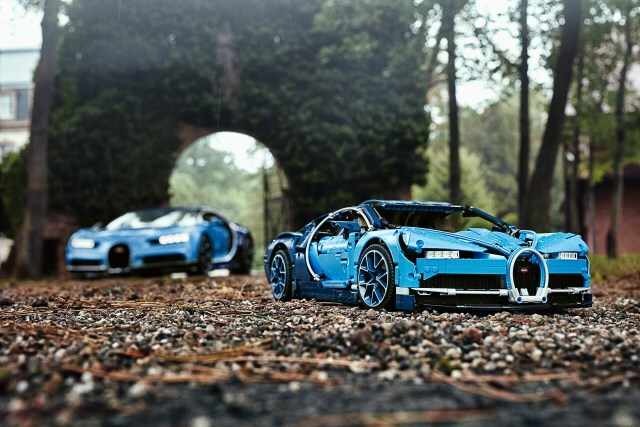 LEGO Group and Bugatti Automobiles S.A.S. have today revealed the new LEGO® Technic™ Bugatti Chiron. The 1:8 scale super car will be available from June 1. The LEGO® Technic™ Bugatti Chiron model brings together the iconic design heritage of the French ultra-luxury car brand and LEGO Technic™ elements, with a reimagined version of the latest cutting-edge super car from Molsheim. The new model unveiled at LEGO House at the company’s headquarters in Billund by Neils B.Christiansen, CEO of the LEGO Group, and Bugatti President Stephan Winkelmann. The 1:8 scale LEGO® Technic™ Bugatti Chiron will be available from June 1, only at all LEGO® stores and shop.LEGO.com, then all retailers globally from August 1, 2018. The model encapsulates the magic, power and elegance of the Chiron, unveiled to the world two years ago and now brought to life in LEGO Technic™ form, offering a unique, authentic building experience for car enthusiasts and LEGO fans of all ages. It’s that time of year again! With LEGO’s H2 Technic sets on the horizon the survivors from our crack team of Elves – sent to infiltrate The LEGO Company’s HQ – have returned to TLCB Towers with this summer’s bounty. So without further ado, here are the brand new Technic sets due to reach stores on August 1st! OK, let’s get the weird one out of the way first. This is a Volvo autonomous loader concept and it is, frankly, one of the oddest Technic sets to appear in recent times. Continuing LEGO’s successful line of officially-licensed vehicles the new concept loader joins the previous (and excellent) Volvo Technic sets, but differs in that it isn’t a replica of a real-life Volvo at all. This makes it – in our eyes at least – utterly pointless. Like many of LEGO’s recent Technic sets 42081 straddles the Model Team and Technic themes, bringing increased visual realism to functional models (only 42081 can’t be visually realistic because there is no real-world equivalent). All-wheel-steering, a mechanically raising and tipping bucket, and – for reasons we simply don’t understand – a model of a quadcopter drone are all included. This is more like it. Aimed at ages 10+ LEGO’s new 1,000-peice 42080 Forest Harvester set is the first to include Power Functions 2.0 (which may also mean the possibility of App control). We’ll have to wait until we get our hands on the new components to test out the upgrades, but the fact that the set also includes new pneumatics is cause for celebration! We expect 42080 to use the new system to drive a pneumatic compressor that powers both the raising/lowering of the arm and the grabby/rolly/cutty thingumy on the end of it (which also looks to feature some new spiky round bricks). Mechanical functions are likely to include centre articulation and working steering, plus a little workbench and brick-built chainsaw are thrown in (somewhat unnecessarily) for good measure too. A staple feature throughout Technic’s long history, we’ve lost count of the number of forklift trucks in LEGO’s back-catalogue. The new set does appear to be one of the best though, and it could very well be the sweet-spot in the H2 Technic range. With Hand-of-God rear-wheel steering, a tilting fork, and an interesting-looking rope-activated lift mechanism, 42079 includes just enough mechanically-operated functionality to be interesting. We think it looks rather nice too, with well-judged Model Team detailing, a few stickers teamed with a nice colour choice, and a bonus mystery barrel containing something dangerous. Aimed at ages 9+ 42079 is constructed from just under 600 pieces and is expected to cost around $70 when it reaches stores in August 2018. Now for the big one. This is 42082, LEGO’s 4,000+ piece, $300 flagship, and it’s massive. With the highest piece-count of any Technic set to date, plus Power Functions, 42082 is set to lift (hah!) the top tier of LEGO Technic even further towards engineering for adults. An enormous extending boom (and it really is huge – the picture above shows it in its most compact setting), superstructure slew, boom raising/lowering and winch control are all driven electronically by LEGO’s Power Functions system, plus there are working outriggers, steering, and a V8 piston engine. As with all of the new Technic sets 42082 will include instructions for a B-model, and it also features a wealth of stickers (each new set seems to include decals denoting the set no.) as part of a trend towards increasing the visual realism of Technic. Third-party (i.e. non-LEGO) bluetooth connection devices such as the superb SBrick and BuWizz feature regularly in the models that we publicise here at The Lego Car Blog. Able to connect your creation to your phone for remote control, and – in the case of the SBrick – even programme your model in way that betters LEGO’s own purpose-built robotics systems, they’ve revolutionised what can be achieved in Lego building. The LEGO Company have been unusually slow to meet this demand themselves, however now (and probably unfortunately for the companies above), LEGO’s own bluetooth-controller is nearly here, launching first as part of the 321-piece 76112 Batmobile set. Part of LEGO’s rebranded ‘Powered Up’ range, the new controller adds bluetooth control and programming to Power Functions and will be available as a stand-alone product that can be added to existing sets and creations following the launch as part of the 76112 Batmobile set. Whether this will ultimately usher in the demise of the excellent third-party bluetooth products used by the Lego Community currently or spur them on to further innovation and development we’re not sure. We hope it’s the latter, as this competition could bring about a multitude of top-quality bluetooth options for Lego models in the near future (we’ll see if we can do a back-to-back review of all three bluetooth controllers later in the year). LEGO’s 76122 App-Powered Batmobile set will hit shelves on August 1st costing around $100, and you can read our reviews of the SBrick and BuWizz bluetooth controllers currently available via the links in the text above. Technic 42078 – Mack Anthem | Set Preview! A crack team of Elves recently returned to TLCB Towers after their top secret annual invasion of The LEGO Group’s Billund HQ, giving our experts first look at next year’s new Technic sets. You can read our assessment of each of the new-for-2018 sets via the link above, but we left one set off the list, the 2018 flagship… the enormous 42078 Mack Anthem. Top of the H1 2018 Technic line-up, 42078 continues LEGO’s successful run of officially licensed vehicles, following sets from Volvo, Volkswagen, Porsche, Caterham, Mercedes-Benz, BMW Motorrad and others. Aimed at ages 11+ 42078 is one of the larger Technic sets of recent times and it includes a huge array of mechanical parts. Yes, mechanical, as 2018’s flagship for the first half the year includes no Power Functions motors (something we expect means that a seriously motorised set will arrive in the second half of the year). Instead a multitude of hand-powered linear actuators are present along with two huge sliding booms deployed to stabilise the side-loading trailer. It’s this trailer which actually looks the more technical build, featuring an elaborate container loading mechanism that holds a wealth of wonderfully useful pieces. In contrast the Mack Anthem truck, whilst big, seems a little devoid of functionality, with only working steering and fifth wheel, and an opening hood revealing a miniature straight-piston engine as its features. And herein lies our issue. 42078 is more visually detailed than probably any Technic set to date, taking the theme to new levels of aesthetic realism. Lights, a complete interior, stickers, and even aerials and a hood ornament aim to blend the looks of a Model Team set with the functionality of a Technic one – surely the best of both themes? Perhaps we’re just a bit grumpy today, but whilst a great idea in principle, the 42078 Mack Anthem offers neither the realism of a Model Team / Creator set nor the technical realism of a Technic one (although we must confess to rather liking the garbage truck B-Model). It’s a big green and grey compromise, a Range Rover Evoque convertible, trying to mash two genres together that are really best left separate. Which means we’re willing to bet that it’ll fly out of stores. For us though, we’re still waiting for a 2018 Technic set that we can get excited about, because the 42078 Mack Anthem isn’t it. 2018 Lego Technic Line-Up Preview! The year that is 2017 is drawing to a close, and as is traditional in the final weeks of the year our Elves have been busy infiltrating The LEGO Group’s HQ. Armed with nothing more than their sharp teeth and ‘unique’ body odour, our mythical workforce have braved the cold of the air-conditioning ducts and the ferocity of the guard dogs (mostly) to bring you LEGO’s brand-new-for-2018 Technic line-up! The surviving Elves are now safely back in TLCB Towers enjoying the fruits of their meal-tokens, whilst our experts have been evaluating their discoveries to bring you full technical details of each set. Let’s get started! Kicking-off 2018’s LEGO Technic line-up is 42071, a rather attractive dozer of the type found in open-cast mines and landfill sites the world over. As has become increasingly common within the Technic range (and a theme you’ll see right through today’s reveal) visual detail is on the increase, and 42071 features a couple of System pieces as well as a wealth of stickers to ramp up the realism. New solid wheels make an appearance – although we suspect these will have little use outside of the fairly narrow niche they occupy in the real world – and the model includes a few neat playable functions, including articulated steering and a height-adjustable blade courtesy of some hand-operating cogs mounted in front of the cab. A decent start to 2018. 42072 & 42073 – Whack! & Bash! ‘Whack!’ and ‘Bash!’ are LEGO’s entry-level Technic sets for 2018, and as is customary they are pull-back motor powered, making them ideally suited for play at the lower end of the Technic age spectrum, and they should be pocket-money priced. …to the most unique Technic set that LEGO have launched in ages. The 42074 Racing Yacht is still at the lower-end of Technic age-range but has double the pieces of the starter sets above – including those two huge new sail parts which look brilliant for making Town-scale awnings with. Being an un-powered vehicle 42074 cannot feature the usual engine and drivetrain combination you’d expect to find in a set of this size, and thus the Technic functions are a complete set of realistic controls for the main sail, including main sheets, a sliding kicker, and a wheel-controlled rudder. It’s a brave move in a market where engines dominate, and one we rather like. Pick it up in stores next year. Back to engine-driven vehicles and we have 42075, a small off-road fire responder. Stickers and lights abound once again, and the set features some reasonable mechanical functions, including Hand-of-God steering, a hand-powered front winch, a piston engine (albeit only two cylinders), and (potentially) rear suspension. Aimed at ages 9+ we expect 42075 to be in the sweet spot for value and features, and it could be a good purchase when it’s released next year. And now things get weird… This is 42076, an odd vehicle-transporting hovercraft, complete with an equally-odd vehicle being transported. LEGO have dabbled in hovercrafts occasionally over the years, but none seem to have recaptured the excellence of 1993’s 8824. 42076 also fails to manage it, being probably less than mini-figure scale and thoroughly strange in its execution. It does include some mechanical functions though, with a linear actuator operated ramp, turning fans at the rear, and a lowering control bridge. But it’s still weird. This is more our bag. 42077 rekindles the mad Group B rally era with a colourful mid-engined rally rocket complete with a V4 (or larger) engine mounted behind the seats, Hand-of-God steering, and rear suspension. There’s some neat detailing too, with an internal roll cage depicted via red Technic axles, bright decals, and a front mounted light-bar. We jump back to the start of the 2018 LEGO Technic line-up with this, 42084 Hook Loader. A sizeable gap in the set numbering system between the sets above and this suggests it was originally planned for release in the second half of 2018, but it’ll now be available from the start of next year. 176 pieces puts 42084 firmly in pocket-money territory, and in contrast the the pull-back monstrosities further up this page it’s a set we rather like. Working steering and a hand-operated hook-loading mechanism teach the basics of gears and levers at an early age, and the set doesn’t rely upon a plethora of stickers to achieve visual realism. It may be small, but 42084 looks to be a decent demonstration of what Technic building is all about. Technic 40th Anniversary | Super Secret Set! Lego Technic is 40 years old this year! Launched in 1977 the Technic range took LEGO into a new world of technical detail, providing advanced construction for older children and adults alike, and bringing with it probably the largest range of new parts in the brand’s history. It all kicked off with a simple car chassis, a ‘New Technical Set’, 853. The single most viewed page here at TLCB, 853 introduced rack and pinion steering, a working piston engine and an operable transmission to LEGO fans. Its success allowed LEGO to develop the theme and three years later the second generation car chassis was released, this time with LEGO’s first attempt at working suspension, 8860. Despite being LEGO’s second Technic car chassis, 8860 is often thought of as the daddy of all Technic sets, paving the way for the series of Technic Supercars that followed (of which you can read more in the Set Review Library). With the Technic theme turning 40 years old this year LEGO have decided to pay homage to one of their greatest products, giving builders the chance to recreate the iconic 1980 set using modern parts found in the 2017 Technic range. Three sets, the superb-looking 42063 BMW R 1200 GS Adventure motorbike, the 42061 Telehandler and the 42057 Ultralight Helicopter provide the pieces required, and building instructions are now available* for free online. Such is the way with the advancement of technology, LEGO’s modern take on the classic 8860 set packs all the functions of the original into a more compact package, and features working steering, a 4-cylinder boxer engine, an operable transmission (which may well be the first since the 1980s not to use purpose-built gearbox parts) and functioning rear suspension. The design uses straight-forward pieces too, so many builders may be able to build it from parts found within their existing collection. You can read our previews of the three sets that supply the full parts list to build the 40th Anniversary 8860 set via the links above, our review of the original set here, and you can create your very own 40th Anniversary set by clicking the link to the building instructions below. *Thanks to a reader for the tip! Yes it’s that time of year again, when a crack team of Elves ‘volunteer’ to be fired over the perimeter wall of The Lego Company’s HQ, tasked with bringing back the brand new Technic sets due for release next year. Elves that manage to successfully navigate the maze of air-conditioning ducts and dodge the guard dogs return as heroes, by which we mean they get fed, and we get to reveal LEGO’s newest Technic sets before they hit the shelves in the new year. On to the sets! Pictured above, the LEGO Technic 42066 Air Race Jet puts the Technic line-up’s on/off relationship with aircraft back into the ‘on’ position. Clearly based on a well-known military aircraft, 42066 covers up its death-from-above intentions with some jazzy stickers, but they look passable if nothing more than that. The set features working elevators and tail rudders, folding landing gear, and an opening cockpit, and will sit in the middle of the 2017 Technic range when it’s launched early next year. We have absolutely no idea what this is. None. Built purely for play value rather than a demonstration of technical engineering, 42065 does – admittedly – look like a hoot to drive with twin Medium motors and skid-steering. We’ll leave that to someone else though, as its aesthetics are about as appealing as the Elves that make up our workforce. Next. This is more like it. 42062 is the first double-vehicle set of 2017, and it looks like a lovely way to introduce Technic to builders stepping up from City and other simpler themes. The neat articulated truck features working steering whilst the heavy-duty forklift includes rear-wheel-steering and a mechanically operable boom lift and grab. Good stuff. 2017’s other multi-vehicle set also sits towards the bottom of the Technic range and it too looks like a good introduction to more complex building. The truck features working steering and a tipping load bed, whilst the excavator includes a mechanically operable shovel. Both vehicles feature a few stickers and more visual detailing than Technic sets of old, and should be priced well within pocket-money ownership. An unusual vehicular streak seems to be running through the 2017 Technic line-up, as a second aircraft joins the range. The 42057 Ultralight Helicopter actually looks more like a gyrocopter to us, but as we assume both the main and tail rotors are connected to the inline two-cylinder engine 42057 is indeed technically a helicopter. More stickers abound and the tail fin steering, controlled via a hot rod style pitman arm, looks novel. Expect 42057 to be priced under $20 when it arrives in stores next year. Finally, some redemption. 42061 is a long way from being the best Technic set ever made, but it is probably the best non-licensed Technic set of the 2017 H1 line-up. All-wheel steering, a mechanically extending boom, and a tilting bucket all feature, and its simple construction should mean 42061 is reasonably priced too.